Addis Ababa, April 6, 2016 (FBC) –An expansion project aimed at raising Bole International Airport’s annual passengers’ handling capacity to 20 million is well in progress. The project, which was launched in January 2015 at a cost of 340 million US dollars, is now 25 percent complete, Engineer Hailu Gebremariam, coordinator of the project told FBC yesterday. 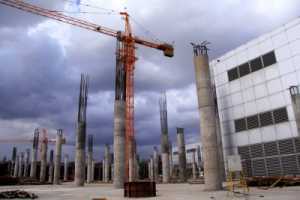 Erecting poles has been commenced after completing the construction of the terminal’s foundation, he said. “If the execution of the project goes on with this speed, it will be completed a head of the plan,” he stated. According to Engineer Hailu, China Communication Construction Company, a firm which was awarded the contract, is working for 16 hours a day in two shifts. The construction of the terminal will be finalized within a year. The construction of a terminal for VIP and domestic flights could be finalized as per scheduled, he added. Once it goes operational, the expansion project allows Bole International Airport’s to handle 5, 479 passengers a day. It also makes Ethiopia one of the five African countries that own modern airports. Ethiopian has also begun planning to build a mini airport city. The airport city will be established within a 100 km radius of Addis Ababa.